Welcome to kennel With Touch! This is where we live with our dogs. I got my first English Springer Spaniel, SUCH INTUCH NUCH Orrlyran´s Hunter, in 1983. Since then I have been showing and starting fieldtrials with several dogs. 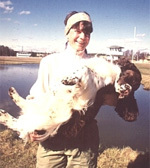 From 2009 I am a workingtest judge and qualified to judge all spaniels. I am also a trained gundogintructor and have held trainingcourses for several years. During the years I've had several comissions for the Swedish ESS Club's committee . For a number of years I was editor for the Swedish ESS Club-paper. My goal as a breeder is to breed naturally retrieving and well constructed dogs with the right will to please. Puppies born at our kennel are raised by their mother until 8 weeks of age, when they are ready to leave for their new homes. All breedingstock is HD-free, eyetested and fucosidosis-tested free or after fucosidosisfree parents. When the puppies leaves for their new homes they are atleast 8 weeks old, vetrinarycontrolled, registred in The Swedish kennelclub, chipped, wormed and vaccinated against parvo. I think it's very important to establish a good contact with the puppies new families. and to get a chance to meet the dog freequently. Puppybyers get help with grooming, raising and training. The kennel is only on hobbybasis and we usually breed no more than one litter a year.